Something to keep an eye out for, unfortunately. If this has happened to you, please contact your alderman. In this case, it took place in the 48th Ward, Harry Osterman's turf. Sending this message because I'm not sure if we have an unscrupulous city employee wandering Uptown. It may be important to get the word out. 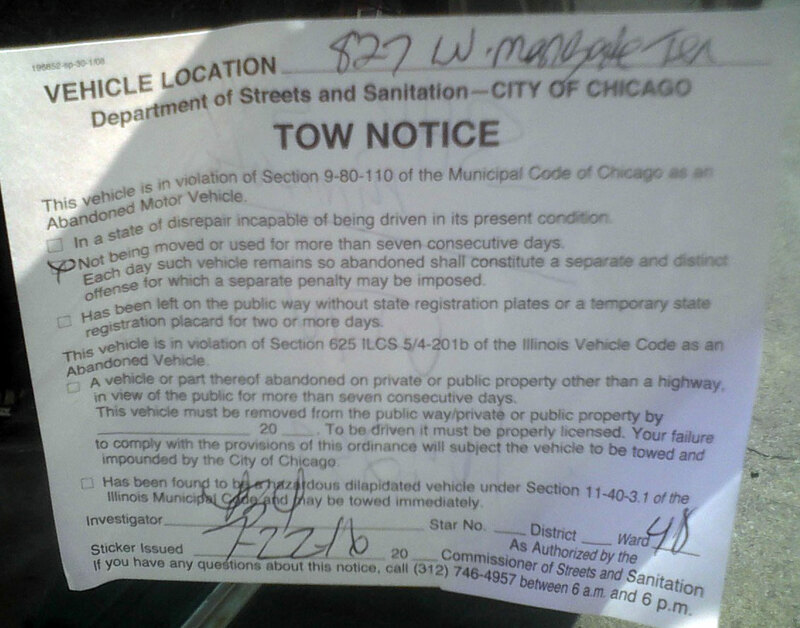 This afternoon I went to my car (parked on the 800 block of W Margate Terrace) and had one of those impossible-to-remove stickers that said "Tow notice" (picture attached), and next to it on the window was some writing. On the notice, a box was checked that indicated by car had been left unattended for more than 7 days. In reality, I legally parked the car about 24 hours ago, and before that I was parked on a completely different block. I have receipts to document I was out running errands yesterday. What was going to happen if I hadn't gone to my car was my car was going to be illegally towed sometime this afternoon. I got lucky, and the only real issue is getting the sticker remnants off my car. I'm also a little concerned they'll just tow the car anyway even though the notice is half ripped off and my car is two blocks away now, so just ignoring it completely seems like it could come back to haunt me. I tried calling the number on the notice, but it goes to a generic voicemail. I left a message but have not received a response as of yet." We advised him to use GooGone on the sticker, and to call the 20th District CAPS office. If this happens to you, the same advice stands. Could it be that a resident reported that this reader's car had been unattended? Did they make any neighbors angry recently? When my mother and a neighbor were feuding years back, the neighbor kept reporting our car as abandoned. Ditto the above comment. A couple years ago we had to park our car a couple blocks away after a heavy snow for 1 night, and even though we didn't take anyone's dibs, I think we still must have angered someone bc I got a ticket in the mail for an abandoned vehicle shortly afterwards. I showed up in court to contest it and it was immediately dismissed after I explained, so if this reader ends up getting a ticket, just know you have options! The same thing happened to me last summer. I own a scooter and parked it in front of my building on Lawrence between two cars. I was running errands that day and opted to park in front for a few hours rather than in my normal gated lot. It was parked for less than 3-hours when I came back out to this 7-day notice. I called the number listed and they told me is was most likely someone annoyed that a scooter was parked where a car could've fit, but as I was between two cars (with room to spare for everyone to get out), no other vehicle could've fit. They ended up clearing the notice and my license plate within 2-minutes over the phone and that was the end of it...But it's a pretty strange process since anyone can make those claims and the city does nothing to inspect it first.